Mike McCarthy (born in Pittsburgh, Pennsylvania, on November 10, 1963) is the head coach of the National Football League's Green Bay Packers, having been hired on January 12, 2006, to replace Mike Sherman, whom the organization had fired ten days earlier following a disappointing season in which the Packers had finished 4-12. McCarthy was an American football tight end while a student at Baker University, an NAIA school located in Baldwin City, Kansas, in 1985 and 1986 and entered the NCAA coaching ranks in 1987, serving first as a graduate assistant at Fort Hays State from 1987 to 1988. In 1989, McCarthy was hired to work under Paul Hackett at the University of Pittsburgh, where he served until 1991 as quarterbacks coach; McCarthy coached wide receivers at the school during the 1992 season. In 1993, McCarthy began a six-year stint with the NFL's Kansas City Chiefs; after working two years as an offensive quality control assistant, McCarthy became quarterbacks coach, overseeing the work of Rich Gannon, Elvis Grbac, and Steve Bono. McCarthy spent the 1999 season in the same position with the Packers, coaching Brett Favre in a season when Favre threw for 4,091 yards, the third-best total of his career. Upon firing head coach Ray Rhodes following the 1999 season, the Packers organization jettisoned the entire coaching staff, and McCarthy found work in 2000 with the New Orleans Saints, for whom he took over as offensive coordinator; he would remain in that position for five seasons, presiding over an offense that scored for 432 points in 2002 and being selected as "NFC Assistant Coach of the Year" by USA Today Sports Weekly in 2000. 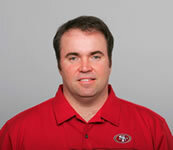 In 2005, McCarthy served as offensive coordinator for the San Francisco 49ers; his unit, beset by injuries and led by a rookie quarterback (top draft pick Alex Smith), finished the season ranked last in the NFL in points scored and yards gained. McCarthy was interviewed by Packers general manager Ted Thompson on January 8 and was offered the head coaching position just three days later. This decision spurred ire among some fans. Nevertheless, McCarthy became the youngest head coach in the NFL, aged just 42 years. However, days later he lost that distinction as 35-year-old Eric Mangini was hired as head coach of the New York Jets. McCarthy is best known for his familiarity with the West Coast offense. McCarthy is also renowned for his work in developing quarterbacks, having worked in various capacities with Favre, Gannon, Joe Montana, Jake Delhomme, Aaron Brooks, Marc Bulger, and Matt Hasselbeck, although Marc Bulger was cut without taking a single snap in preseason. Upon his hiring, McCarthy expressed hope that his history with Favre and his comfort with the offensive system employed by the Packers would lead Favre to return to the club for his 15th season. In the weeks after his hiring, McCarthy retained some assistants from Sherman's former staff but notably released offensive coordinator Tom Rossley, whom McCarthy replaced with Jeff Jagodzinski. Jagodzinki, as tight ends coach, had been on Rhodes's staff with McCarthy in 1999. Jagodzinski was selected for his expertise in the zone-blocking scheme popularized by former Denver Broncos and Atlanta Falcons offensive line coach Alex Gibbs. McCarthy attempted to persuade defensive coordinator Jim Bates to remain with the team, but Bates, who had been a candidate for the head coaching job, resigned a few days later. The selection went to Packers defensive ends coach Bob Sanders, a Bates disciple, who was chosen for his vast knowledge of the modified 4-3 defensive scheme his mentor had installed the year before.